The new version, Invincible Warrior will be available on September 11th. New Warriors will have skills that other classes don’t. The weapon of The Miracle, it was bathed in the blood of Evil Demons in that legendary war. 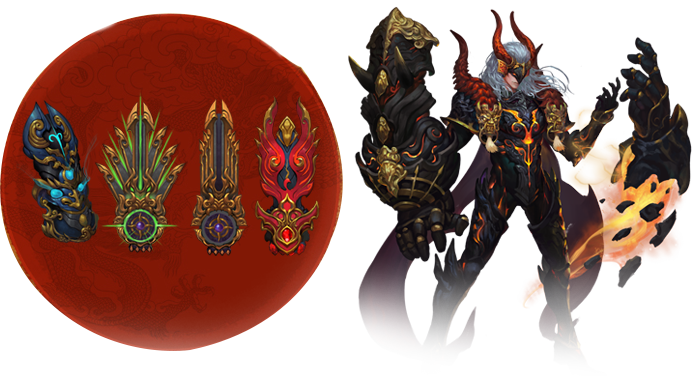 So heroes who equip the Fist of Burning will transform to berserker and bear the desire of fire and blood. Equip a pair of Fists to cast this active skill. Deals severe normal damage on all the targets within the front sector of 8 paces, and grants +15 XP to the caster, every 8 seconds. The interval decreases by 1 second after each use. Cost: 15 SP. Wave of Blood is a typical AoE skill which deals high damage on a group of enemies instantly within a wide range. In addition, the XP bonus enables the caster to use fierce XP skills more frequently and makes an invincible hero. Must equip a pair of Fists to trigger this passive skill. While making a normal attack, the caster has a chance to deal damage on all targets within the sector of 5 paces (more damage to monsters), and extra damage within 12 seconds (more damage to monsters). The hit rate drops by 5% for each 1 BP difference. Your normal attacks will have a chance to trigger this passive AoE skill which inflicts damage on enemies and continues to deal more damage. Once triggered, it gives enemies and monsters no chance to heal themselves. Equip a pair of Fists to cast this XP skill. Makes the caster immune to physical attacks and deals continuous damage to the enemies within 5 paces (more damage to monsters) for 15 seconds. This marching skill is exclusive for Warriors, which allows them to deal a pile of damage on nearby enemies while moving forward, and, at the same time, completely block physical damage. Maniac Dance sweeps away all in the way. If the caster is attacked, reflects the damage (up to 50000 points), equal to a certain percentage of the caster's current HP, against the attacker and restores 30 Stamina Points, once. Lasts for 10 seconds. Cooldown: 15 seconds. Must equip a pair of Fists to trigger this passive skill. Retains the caster's XP upon revival.